I love drinking tea. Jonathan and I have tea at least twice a day, in the morning and at night, and usually a few times in between. For me, though, having tea is often more about the delicious goodies that go along with it. Yes, I love tea just as it is, but I'm not going to complain if it happens to come with a crunchy biscotti or a thick slice of moist tea cake. 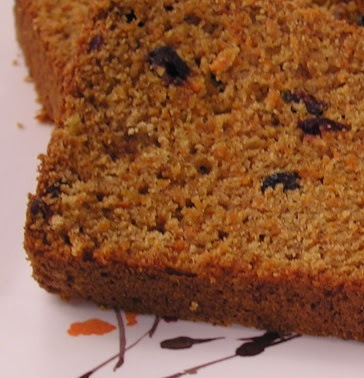 We posted a few times about pumpkin bread, which is the ultimate in tea cake-like creations. Even so, you can't have pumpkin bread all the time (can you? ), so I've been forced to branch out with my sweet quick-breads. Sure, I enjoy the standards: banana, banana-walnut, zucchini, gingerbread...but it's always fun to try something new. Hence my Moroccan-spiced carrot bread, a recipe inspired by a classic Moroccan carrot salad. I love the combination of sweet and spicy in Moroccan food, and carrots with raisins and spices seemed like it would be as good in loaf-form as in salad-form. The first time I tried this recipe, I was so bold as to add cumin to the batter. I've omitted it from this version because I thought it was just a tad too much, but if you are feeling adventurous, you might want to give it a try (just a pinch or two, though). The bread is still decidedly sweet, but the combination of lemon, almond, carrots, and raisins provides a very interesting (and addictive) flavor. Sift flour, baking soda, baking powder, and spices into a large bowl. In a separate bowl, mix eggs, sugar, honey, baby food, olive oil, and almond extract thoroughly (Tip: Use the same measuring cup for the oil and the honey. Measure oil first, then honey. When you pour the honey, it won't stick to the cup). Add the carrots and raisins. Mix the wet ingredients into the dry ingredients just until combined, being careful not to overmix. Pour batter into a greased loaf pan and bake at 375 F for 45 min.-1 hr., until tester inserted into center comes out clean. Pumpkin bread is good when slightly undercooked, but you want to cook this bad boy all the way through. Well, if the batch I tried was the "first draft", then I really can't wait to try the final cut- yum!